I'm so excited today to tell you guys a little more about a brand that is just full of beautifully formulated products. It's a green beauty brand I'm sure a lot of you have heard of, but True Nature Botanicals is so full of stunning products that I've got a lot to say! The brand was founded by Hillary Peterson, a woman passionate about creating the most luxurious, effective skincare products possible. She uses some of the very best ingredients possible to provide her consumers with only the very best products, a few of which I've been lucky enough to test out and share my findings with you guys. First up is the brand's Pacific Everday Sheer Coverage in Light Tint*, a product I actually wrote about in a recent post. With SPF 20 (provided by non-nano zinc oxide), pearl powder and broccoli seed oil this gem is not only chockfull of skincare goodies but also is the most wonderful sheer coverage option. While it's just pigmented enough that it leaves you with a sheer, semi-matte finished coverage, it's the pearl powder ingredient that really provides a sort of soft-focus effect that really gives your face a lit-from-within glow. Another product from the brand is their Pacific Vitamin C Topical Treatment*, a jar full of pure Vitamin C capsules that can be broken open and added to your facial moisturizer for extra rejuvenation. This product is definitely the first of its kind that I've ever used, so I'll admit to being a little hesitant when I broke my first capsule open and mixed it in with my moisturizer. After several weeks of using this a few nights a week, though, I can happily say that I have been so pleased with the results. It's not at all irritating to my skin but instead the Vitamin C completely brightens up my face, leaving my skin feeling a lot healthier and cleaner come morning. Speaking of night time treatment, one of my absolute favorite discoveries from the line has been their Pacific Night Serum with Retinol*, a product I've been wanting to try for a long time now. Toted as a powerful serum with Retinol and Marine Bioactive Peptides this is the perfect Retinol treatment for those of us with sensitive skin. I wear the formula underneath a facial moisturizer (either a facial oil or cream) several times a week and the results have been wonderful. Not only does this not dry out my skin at all (a common occurrence for most to all Retinol based products) but instead it has helped immensely even out my skin tone as well as heal acne scars that have been lingering on my face for goodness knows how long. I couldn't be happier with the results of this and am already planning out my paychecks for a repurchase once I run out (something I don't see happening for awhile, thankfully!). 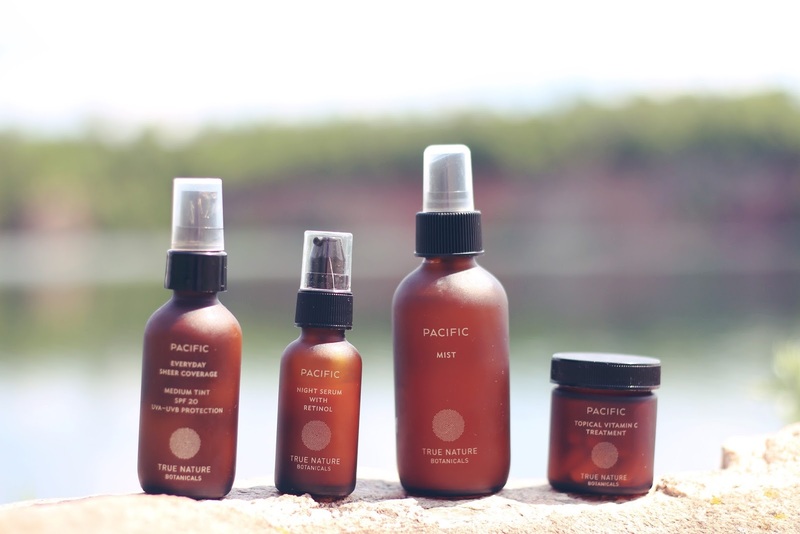 One product that I've found success layering over the Retinol Serum has been the brand's Pacific Face Oil*. This facial oil contains beautiful seed oils that help to both hydrate and clear your skin. Some of these oils include chia seed, kiwi seed, papaya seed and passion fruit, all fruits high in Omega 6 and Omega-3 fatty acids which quickly absorb into the skin and condition it while also helping dissolve impurities (i.e. acne). Basically, combining this with the beautiful Retinol Serum creates a powerhouse concussion that will leave your skin positively radiant. Finally from the line, I've been testing out their Pacific Exfoliating Cleanser* and Pacific Mist*. The cleanser is formulated with ingredients like Manuka Honey, Chamomile powder, Adzuki bean powder and Actifolate. These gentle ingredients all combine together to create a highly effective exfoliating cleanser that works perfectly even for those like me that have more sensitive skin. I love using this cleanser in the morning as an easy way to perk up my skin, removing any impurities or dead skin cells to leave me with a fresher face for the day. The mist contains ingredients like white and green tea, sea kelp extract and sea fennel extract which work together to create a wonderfully soothing and hydrating mist that's perfect for sensitive skin. I love using a spritz of this after cleansing and before adding a bit of oil and have found that it leaves my skin feeling as refreshed as can be. I've found myself using this both morning and night, the scent is one of the most relaxing parts of my evening skincare routine.